Low Containership Demand: A Manageable Challenge? 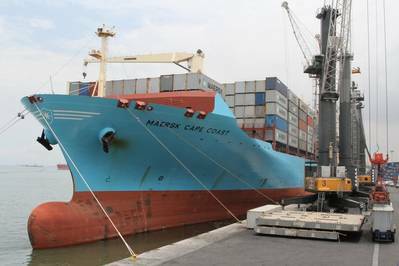 Is the lack of demand for containerships a manageable challenge? The low demand on the high volume trade lanes is increasing the pressure on earnings which is already felt in the container shipping industry, says shipping association BIMCO. This was one of the views that BIMCO’s Chief Shipping Analyst, Peter Sand, shared with the participants at the Maritime Cyprus 2015 Conference as he played an active part as a panelist on the session that focused on the future of the shipping market. As shipping is a derived demand of global economics, Sand raised attention to the difficult start of 2015 where global containership demand grew by as little as 1.1 percent. “Volume growth on the vital trade lane from Asia to Europe and Asia to US West Coast were down by 4.2 percent and two percent respectively. Whereas demand growth was positive on Asia to U.S. East Coast and on Intra-Asian trade lanes,” Sand said. Imports into the U.S. East Coast will be even more in the limelight next year, as the third set of locks in the Panama Canal opens up for business in 2016. This new “battlefield” will put focus on the Ultra Large Containerships. “We expect to see a significant change to the ship sizes that will call U.S. East Coast ports. As the ports have prepared themselves for the opening and stand ready to receive Ultra Large Containership coming via both the Panama as well as the Suez Canal. Competitive canal transit pricing is likely to play a central part when networks are optimized next year,” Sand said. In spite of the currently depressed markets, there is ample room for optimism going forward, according to BIMCO. This goes for the container shipping sector as well as for the dry bulk and tanker industry. “Increased private consumption in EU and the US should provide higher demand for containerized goods on the vital high volumes trade lanes than what we have seen in first half of 2015. This will slow down cascading. Demand on Intra-Asia will stay positive, whereas new demand may arise from Iran, Cuba, Brazil and Africa”, added Peter Sand. According to Vesselsvalue.com, the number of ships owned by Cyprus is 238, with half of them being dry bulkers, and the other half being 60/40 split between tankers and containerships. However, Cyprus also enjoys being the world’s third largest location for ship management, bringing with it a lot of shipping interests from all over the world. The conference took place in Limassol, Cyprus on the September 13-16, 2015. It was the 14th Maritime Cyprus conference and this year's theme was "Game Change”. The conference focused on the market forces affecting international shipping, from policy and regulation to developments in the economy, environment and technology. Peter Sand acted as one of the panelists on the segment titled Markets “Oracle”, Wednesday, September 16, which looked at developments in the three main shipping markets dry bulk, tankers and containers. The other panelists were: Katharina Stanzel, MD of INTERTANKO and John Bamford MD of S&P at SSY.